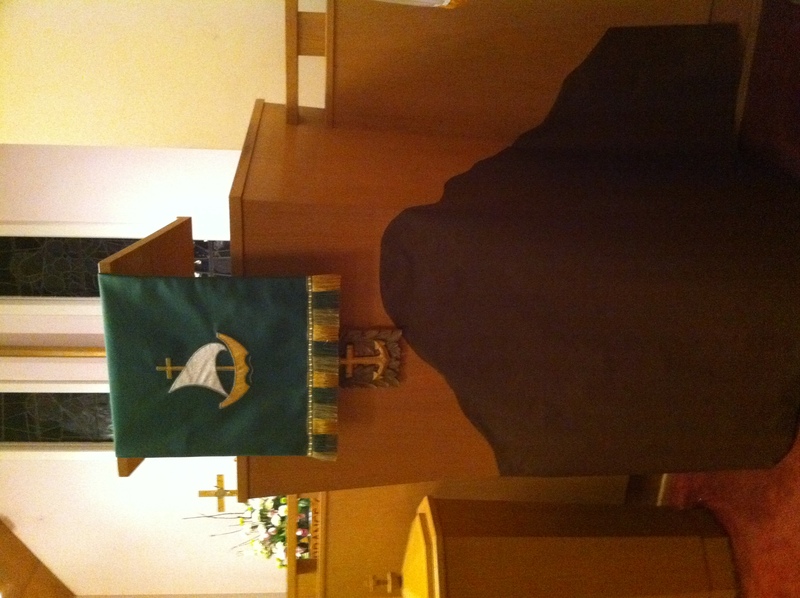 You may have noticed something a little different and strange about the pulpit this morning – there’s a little extra decoration around the base of it. You see, we’re up on the mountain today and over the next seven weeks, working our way through Jesus’ famous Sermon on the Mount, and I figured a little visual reminder of this might help us all to keep this in mind! Chapters 5-7 of Matthew’s gospel recount these famous words spoken by Jesus to his disciples and the crowds who followed him up the mountain, and in these three chapters we find a great deal of what stands at the center of the Christian message. Here on the mountain Jesus offered his disciples what has come to be known as the Lord’s Prayer. Here Jesus laid out the simple and beautiful beatitudes, nine statements of blessing for those we might least expect. Here Jesus called out the hypocrites for giving alms and offering prayers so that they might be seen doing it. Here Jesus conveyed his own version of what we have termed the golden rule: “In everything do to others as you would have them do to you.” Here Jesus suggested that judgment must be as much about the one making the judgment as it is about the one being judged. And here Jesus responded to different viewpoints on how to follow the law and prophets of the Hebrew scriptures by suggesting that the spirit and the letter of the law matter. Over the next seven weeks, we’ll look at these and other wonderful sayings of Jesus from this sermon that give us a vision of something new from up on the mountain, all concluding on Transfiguration Sunday, when we celebrate how Jesus himself was transformed on another mountain as a sign of the transformation that is possible for us too. And so we revisit these familiar words, hoping that the mountain will strengthen us and hold us fast in our faith, but nonetheless remembering that Jesus offered the Sermon on the Mount not to comfort the people and enshrine their way of life but rather to challenge them by offering a vision of something new. Jesus opened his sermon up on the mountain with a provocative series of statements of blessing that we heard a few minutes ago, but I want to read them again, this time from that often-helpful paraphrase The Message. You’re blessed when you’re content with just who you are – no more, no less. At the moment of being ‘carefull,’ you find yourselves cared for. You’re blessed when you get your inside world – your mind and heart – put right. Not only that – count yourselves blessed every time people put you down or throw you out or speak lies about you to discredit me. You can be glad when that happens – give a cheer, even! – for though they don’t like it, I do! And all heaven applauds. And know that you are in good company. While there is something important in each of these statements of blessing, I think that they are best understood when we read them as a whole, because the reality is that none of them are really about God showing particular blessing to those in a particular predicament. Instead, in the Beatitudes Jesus offers a broad stroke against the way the world appears to be and assumes to operate, insisting that God’s blessing is not for the rich and famous and powerful but belongs instead to those in greatest need and proclaiming that God is overturning the supposed wisdom of the world and putting forth a new and different way. As such, Jesus makes it clear from the beginning of this time on the mountain that things look different here in this place where God’s new way – God’s kingdom – has started to take hold. The poor are the ones who will inherit all good things here. Those who mourn here will not be left alone in their grief. Those who trust God to free and redeem will be set loose from the bonds of injustice here. Those who hunger and thirst here will be filled and their thirst quenched. Those who show mercy and forgiveness will find it shared with them here. Those who live with integrity in body, mind, and spirit will find God at work here. Those who seek reconciliation and wholeness will find it in their life with God here. Those who are threatened because of their behavior that follows in this way will be at home in this place. And those who suffer because of Jesus’ own life and message can rejoice because that suffering is not the final word, just as it was not the final word for Jesus himself. In the end, though, blessing comes less from these individual things being realized and more from justice and peace becoming the norm, love and mercy prevailing always, and a vision of something new taking hold in the world. Making this vision of wholeness and newness real isn’t as easy as it would seem. At one level, these are incredibly simple practices and moves for living that can seemingly be lived out so easily. It would seem easy to give up everything and be poor, to mourn, to trust God, to remain hungry and thirsty, to show mercy and forgiveness, to live with integrity, to seek reconciliation and wholeness, and all these other things. But if we take these words seriously, we see how difficult all these things really are. We see how hard it is for us to let go of our way of life, to trust that there is something more than what we can directly control, to show others the respect we demand for ourselves, to seek reconciliation rather than furthering brokenness, or to open ourselves to suffering for the sake of others. The Beatitudes, then, call us to a way of life that we can’t make happen on our own – but that doesn’t make us exempt from trying to live them out, nor does it make it okay to just leave them for a day beyond our grasp. We can’t just pretend like they are some view of some promised land we will never reach or will only find once we are no longer in this world – the way of life Jesus proposed as he began this conversation up on the mountain must always be before us as our goal and hope. But living the Beatitudes becomes possible, practical, and even wise when we live them together and trust that God will work through us to make all things new. When we seek to discern how to respond to the poor in spirit as a congregation, we are blessed. When we join those who mourn death and darkness and injustice in our world and start working to shine new light into these places, we are blessed. When we trust the wisdom of God above and beyond our own intelligence to guide our life together, we are blessed. When we seek to satisfy the real, deep hungers and thirsts around us, both physical and spiritual, we are blessed. When we show mercy and grace to one another and all the world, we are blessed. When we live integrated, faithful lives that are true to the creation whom God made us to be, we are blessed. When we make wholeness, healing, and peace possible in the relationships around us and demonstrate that in our life together, we are blessed. And when others hurt and persecute us or walk away from our fellowship because we live in these ways of wholeness and faithfulness rather than just checking off obedience to a series of rules and regulations, we are blessed. Living the Beatitudes together isn’t easy, but it is what God intends – how God intends for us to demonstrate that the world does not have the final word, how God invites us to stand up and live in a new and different way, how God allows us to join in the new thing that Jesus proclaimed from atop the mountain. And so from this mount may we see a vision of the life God intends for us and seek to live in this way together every day even as we open our eyes to what God intends for us and our world and we wait and work for Jesus’ vision to become real through God’s work all around us. This is not a sermon but rather a real blog post! Who knew!! As a single person, my best bet for spending time with other people during the holidays is with my parents, and since I’m an only child, that makes it all the more important that I be home for Christmas. As a pastor, though, I have responsibilities on Christmas Eve, so over the last several years I have grown accustomed to traveling on Christmas Day. My first Christmas as a pastor, Christmas Day was also a Sunday, and I ended up spending Christmas night 2005 in a hotel near the Cincinnati airport by myself – an experience I do not care to repeat. This year, the crazy weather up and down the East Coast threw a small wrench into my travel plans, but for once I was grateful for the travel difficulties. Along the way, I experienced two new ways of being home for Christmas. First, on a quick flight from JFK to Washington, DC, I found myself sharing a row at the back of the plane, directly next to the engine and across from the lavatory, with a flight attendant commuting home after her shift had ended. She had just returned from a round-trip to Senegal, one of several west African routes that she works regularly. I mentioned very briefly my travel troubles around Christmas, and she certainly understood my experiences – she herself had been working as a flight attendant on international routes since 1971 and had spent many Christmases away from home. We shared many wonderful stories about travel strangeness like this, but her stories were incredible moments of finding some sort of “home for Christmas.” She recounted two experiences of being welcomed into homes in Italy and Austria – places where Christmas celebrations are often limited to immediate family, with even significant others of family members asked not to attend – where she was welcomed as one of the family. Even as a guest who looked very different and came from an entirely different culture, she received gifts from others in the family and was at one of the gatherings even seated at the place of honor next to the host! Her stories were incredible, and I will never forget the time we shared on that brief flight, fellow travelers from very different places and backgrounds who nonetheless found a little bit of home for Christmas together. If that weren’t enough of a home for Christmas, I then had the privilege of sharing a couple hours with a Twitter friend and colleague in ministry, Leslianne Braunstein. Although we had conversed a bit on Twitter and discovered some mutual friends and experiences, we had never met in person until Christmas Day. My new itinerary called for a four-and-a-half-hour layover in Washington, and Leslianne graciously volunteered to spend some of it with me. So we sat in a virtually-empty restaurant at Reagan Airport and shared appetizers and incredible conversation for nearly two hours. Though we too came from different places even amidst our shared experiences, in that time together we found another glimpse of home for Christmas. I eventually made it home with far less travel drama than I had anticipated – and I walked away with two wonderful stories. But even more, over the twelve days of Christmas this year, I have carried these moments with me as reminders that the home we find for Christmas may come when we least expect it, around people with very different experiences, in the midst of frustration and anxiety and uncertainty. Though I was very glad to make it home for Christmas this year, I was even more grateful to see some other visions of home along the way and to share them with wonderful people each and every step of the way. As this Christmas season comes to an end, I hope that you found some glimpse of this kind of home somewhere along the way too. Thanks for letting me share my story of going home for Christmas. Happy ninth day of Christmas! With the blizzard and all the other things swirling around us over the past week, it is easy to forget that our celebration of Christmas continues today and concludes only with Epiphany on Thursday and Baptism of the Lord next Sunday. These twelve days remind us that there’s more to the coming of Jesus than a baby born in a manger, angels appearing to shepherds, or even the journey of the wise men to Bethlehem, and our reading this morning from Matthew’s gospel is an incredible and even disturbing reminder of the other side of Christmas. This truly unpleasant text shows up in the lectionary on the Sunday after Christmas every three years, just rarely enough that pastors can easily skip over it with a Christmas carol sing or pass it off to a guest preacher! Last Sunday, while relaxing at my parents’ house on the day after Christmas, we tuned in the downtown Methodist church’s weekly TV broadcast to find a young woman, their pastor to young adults, facing the challenges of preaching this text. She had drawn the short straw this year to preach on the day after Christmas, so she offered a simple proclamation of this strange text about mass murder in the midst of a season filled with joy. So today, we’re facing that text together, too, not so that I can just reuse her insights but because the light of our candles on Christmas Eve fades and the strains of our carols grow faint on the other side of Christmas as the real world creeps back into things and we have to make sense of love and hate in our world. According to Matthew’s gospel, visitors came to Judea looking for Jesus after seeing a star in the east that indicated that the king of the Jews had been born. They started their search for the newborn king at the palace, where they learned little and only aroused the puppet king Herod’s attention. As they continued their search, Herod asked them to return and give him a full report on what they found, but after they found the child, they went directly home by another road. So in our reading today, we hear that an angel of the Lord spoke to Joseph and directed him to flee to Egypt with Mary and his newborn son. They got away just in time. Once Herod figured out that the wise men were not going to help him put down this apparent threat to his reign, he decreed that all children in and around Bethlehem under age two were to be killed. As a side note, I think it is important to note that there is no historical record of this mass murder of about twenty children in this small village, but as one commentator puts it, “it is nevertheless consistent with what we know about Herod.” (R. Alan Culpepper, Feasting on the Word) He was known to have his enemies and even his friends ruthlessly punished for crossing him, and that commentator notes that he even commanded that upon his death “political prisoners should be killed so that there would be mourning throughout the land.” With this kind of king holding even limited power, Joseph, Mary, and Jesus remained in Egypt until they received word in another dream that Herod was dead. But Joseph was still concerned – Herod’s son Archelaus was his successor, and Joseph suspected that cruelty and oppression of Herod’s sort rarely skips a generation, so rather than returning to Bethlehem, they made a new home in Nazareth, in the region of Galilee, outside the reach of Herod and Archelaus. Finally settled in to their new home in Nazareth, Mary, Joseph, and Jesus could emerge from the other side of Christmas, yet they surely would not be the same as they tried to make sense of the love and hate they had witnessed. Matthew suggests in his story that all these things happened to fulfill the words of the prophets and show that Jesus had been through all the trials of the Hebrew people – going down to Egypt, returning to the promised land, and continuing in his own version of exile – so that he could emerge to a new way of faithfulness even amidst the old stories (Stanley P. Saunders, Preaching the Gospel of Matthew), an important perspective for his first readers who were most likely steeped in Judaism. But there is something equally if not more important for us in these words to help us see that there is more to Christmas than dreams (and occasional realities!) of a white Christmas, visits from Santa Claus, or even a baby born in a manger. The other side of Christmas is clear to many in our world, but we so rarely speak of it. Some people find the joy of this season so difficult in the midst of mourning, pain, and loss, as they face the season distant from those they love due to death, illness, or displacement. Others must travel to spend these days with friends and family as is the custom and requirement, only to find even the best-laid plans disrupted by snowstorms and airlines and other complications that we know all too well after this last week. But even these pale in comparison to the millions around our world who face harsh persecution and life in exile more directly as Jesus, Mary, and Joseph did, forced to move from their homes and families due to genocide, suffering, war, and religious or ethnic strife. And so Matthew also offers us a story that reminds us that Jesus knew the other side of Christmas very, very well himself. Mourning, pain, and loss came right alongside his birth. Strange travels and new homes were part of his experience as an infant. Exile and displacement were his experience from his earliest months. In fact, I don’t think it is unreasonable to suggest that the prosperity and joy that stand as the ideal for us in these days were far from Jesus’ own experience. Even though he began his days with visitors from far away who brought him fine and extravagant gifts, Jesus lived much of his life like a refugee, wandering from place to place, never completely at home, always waiting in fear of what might come next, surviving only by the power of God to protect, save, deliver, and free. With a savior like this, whose origins are on the other side of Christmas, in a world very different from our own, it seems to me that we should not get too comfortable on this side of Christmas. Jesus is already on that other side of Christmas, and his life and ministry and death and resurrection all invite us to join him in that world – our world, filled with refugees, homeless women and men, persecuted persons, and victims of every sort of violence and hatred – our world that so desperately needs the work he has already begun to bring comfort and peace and hope and salvation to all. Our world needs more people to step in and stand with those who are in times and places and situations like Jesus’ – those we know in our lives who find new situations and difficult challenges before them in this new calendar year because of death, illness, or other uncertainty; those in our world who are displaced from their homes or are forced to walk away from their families and friends for their own safety, like refugees in Palestine or Darfur; those whose lives have been torn apart by war, like women, men, and children in Rwanda, North and South Korea, Afghanistan, and Iraq; and even those in our own city and nation who are forced to move from place to place to find work or a safe place to live. One week from today, the people of southern Sudan will vote on their independence after decades of violence and war have torn their lives apart. Over the coming week, as a step into that other side of Christmas, I urge you to keep the people of Sudan in your prayers, and there are a few suggestions for prayers available on handouts in the auditorium at refreshments today. While there may seem to be little we can do to make a difference in these and other similar situations, the life of none less than Jesus himself demands that we speak up about injustice, call out for life and peace in the midst of death and destruction, pray for a new way to take hold and shape in our world, and step in where we can in whatever way that we can to work for a world where violence is not the final word and God can step in to make all things new. And so my friends, this is the other side of Christmas – a place where we join God in stepping in to a broken and fearful world as God has already done with boldness in Jesus Christ and pray and work and pray some more for all things to be made new on both sides of Christmas. Lord, come quickly! Amen.